Come to Speedy Scrappers on Saturday, November 9 and learn to make this Dazzling Datebook! 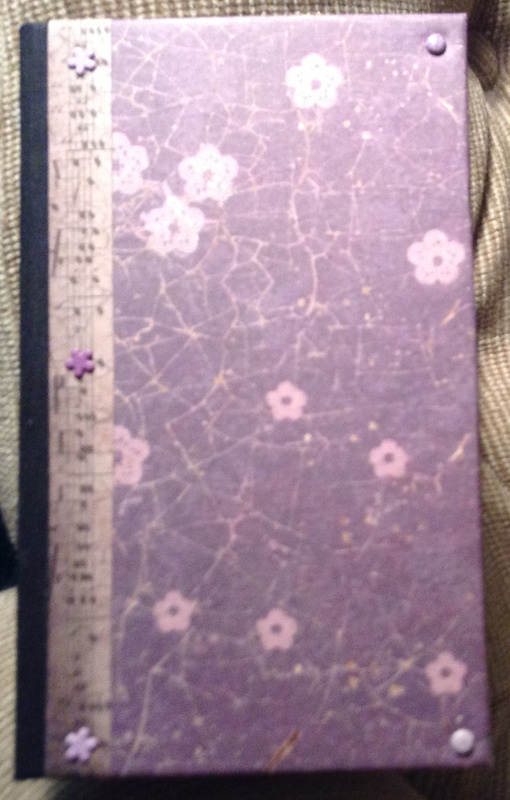 You will learn basic bookbinding techniques that you will use transform an inexpensive 2014 datebook into a treasure you’ll enjoy everyday of the new year. You’ll receive complete written instructions so you will be able to create as many of these little beauties as you like. They make great stocking stuffers for friends, family and co-workers! The datebook includes pages for notes, addresses and contact information, and weekly & monthly calendars in a perfect size to fit in your pocket or purse. The cover is soft and pretty. You’ll use Irish waxed linen and Irish linen bookcloth with beautiful cover papers of your choice. This workshop is perfect for anyone! No bookbinding experience is needed. Your registration fee includes all of the materials you will need to create one datebook. At the start of the workshop you’ll choose one or two sheets of Speedy Scrappers gorgeous paper to use for your cover and for the inside of the datebook, and some little “extras” to make your datebook really special. In the workshop we will discuss several variations for your datebook that you may wish to try at home. Participants are asked to bring a pair of scissors, metal edge ruler, and a pencil. If you have a bone folder and/or awl, please bring those, too. If you don’t have these items, the instructor will have tools for you to borrow. For more information or to register, please follow the “Speedy Scrappers” link to the right. Or, stop in Speedy Scrappers and take a look at the sample on display.